EMINENCE是欧洲护肤品牌，有超过40年的发展历史，下面是EMINENCE官方网站的介绍信息： We are proud to offer you our complete line of European beauty essentials, which contain the highest possible levels of all-natural organically grown herbs, fruits and vegetables, hand-selected to guarantee their highest quality. Over 40 years of experience and extensive research have proven the effectiveness of these superior Spa treatments, a unique combination of hand-picked fresh ingredients which are hand-mixed with pure waters drawn from a thermal hot spring lake containing minerals and trace elements found nowhere else on earth. All of our products are handmade in Hungary-no mass production-without any heating or hydrogenating processes. Your clients will immediately see and feel the difference evolving from the extremely high fruit content, and therefore, the high level of active ingredients. Vitamins are captured in their all-natural fresh base, offering dramatic results as actual seeds, pulps and peels begin the regenerative and healing powers that only nature can produce. 品牌哲学： Is to provide premium products and unparalleled service to leading salons, spas and beauty professionals. Our products are not mass produced and do not contain artificial coloring or fragrances. Our ingredients are hand picked and hand harvested to ensure premium quality. 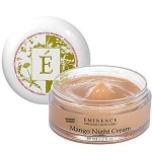 Every ounce of Éminence products receives personal attention to produce and package.